High-speed printers have become quite popular throughout the years, as they allow a company to enjoy high volume printing in full colour or black and white, depending on their unique needs. These printers are also referred to as continuous feed printers and they can be seen in a variety of printing companies around the world. Continuous feed printers are ideal for the printing of bank statements, invoices, magazines, books, newspapers and more. These units provide high speed, digital colour printing at its best and have been designed to deliver reliable service for years at a time. It’s the ideal solution for companies that need to do high volume printing on a daily or monthly basis, as this will reduce their ongoing expenses over time. These reliable and popular machines are often used in data centres, direct mail service providers and specialised commercial printing houses. Continuous feed printers offer excellent image quality and can handle a large capacity. They can accommodate long, unattended runs using roll feed unwinders and automated post-processing finishing for cut sheet, fanfold or rewound output. You can also easily attached pre- and post-processing equipment, making these machines extremely effective and versatile to use. You can also use these printers with adhesive labels and other specialty stocks so they are truly effective all-round. Xerox has a wide range of continuous feed printers to enjoy and they are not only reliable but offer superior printing quality. If you are not sure which unit to choose you can speak to a sales representative from Document Excellence to help you choose the ideal solution for your unique printing needs. We make sure that you get the best value for money while benefitting from one of the most popular printing suppliers. You can also rent printers from us to benefit from an immediate, cost-effective solution. 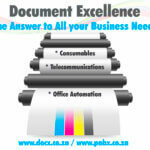 Document Excellence is a leading supplier of high quality printing solutions to various digital printing companies in South Africa. We are also an authorised Xerox distributor, allowing us to provide you with cost-effective printers, copiers and consumables for your office environment. Contact us today to find out how we can help you with all your unique printing and consumables needs.